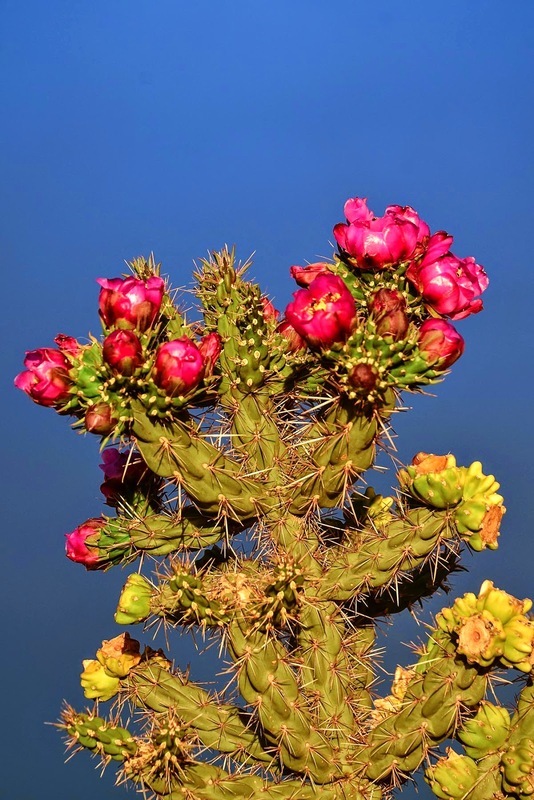 Last September's record rainfall has made it a banner year for cholla cactus. Every evil specimen is bursting with color. Here's a pronunciation refresher: it's choy-ya, not chole-la. 3) I spend an inordinate amount of time trying to get rid of it. For all its faults, it makes for some pretty pictures, particularly against a stormy sky. 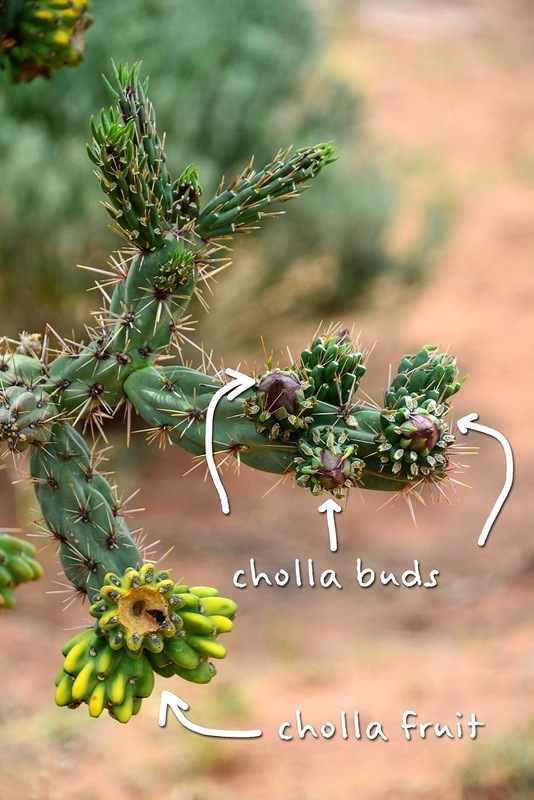 Every time I blog about cholla, I learn something new because I start googling things like "is cholla edible?" and provide sustained energy. That all sounds well and good until you get the spines stuck in your fingers forever. Do you know what the hardest part is about living alone? Removing cactus spines from your right hand when you're right handed. the pops of color that bring the desert and my outdoor décor to life. Mother Nature always seems to know what she's doing. Hope you get lots of pretty pics with the boys & girls and blooming cactus. Especially Lucy, because pink is her color! I visited Arizona this year and thought of you when I was on the Cholla Trail. I took a picture of it and told my children to stay away from it. My cousin says that the locals call it Jumpin' Cholla. It seems to jump into you even when you weren't that close. I vote long lens! They look terrifying! Pinterest is a wonderful spot for ideas. Put a piece of tape on the sliver or cactus spine and pull it out. I've tried the tape - it works for some cactus but not for others. The cholla spines have a barb on the end that gets stuck in tight. Interesting nutrition information. Have you tried a cholla fruit or do they have prickly protection also? I wouldn't want to try and remove cactus spines from my mouth :O !!! with either hand. Have you tried duct tape ... rip-em out like a waxing job ? Love the pictures ... all the color and contrasts, but I do understand your frustration with a pesty plant that is difficult/impossible to contain or eradicate --> thinking about invasive bermuda and &*%@ periwinkle :( and some other assorted pesty vegetation I deal with. I have not tried a cholla fruit. Though they look smooth and harmless, they're covered with miniscule invisible spines. Yes, I learned the hard way. Cholla Gumby is still standing - I think of you every time I drive by. My Dad lives in Arizona and we have had many encounters with the famous Cholla. However, I have never seen it bloom. It is beautiful! My son fell into a Cholla one time and we spent 6 hours in the ER getting the spines pulled out of his hand. One spine went all the way through his hand! Bad, beautiful stuff, the Cholla! Falling/tripping/backing up into a cholla is one of my worst fears. I'm told if you spread Elmer's glue on the area and let it dry, the spines will come out when you peel it off. I keep a bottle handy. I live in Arizona and I've never seen it bloom. We have the Teddy bear kind and it's supposed to get yellow flowers but I haven't seen them. They do look cute and fuzzy but I hate them. Yes, Carine. Google cholla recipes and you will be amazed. 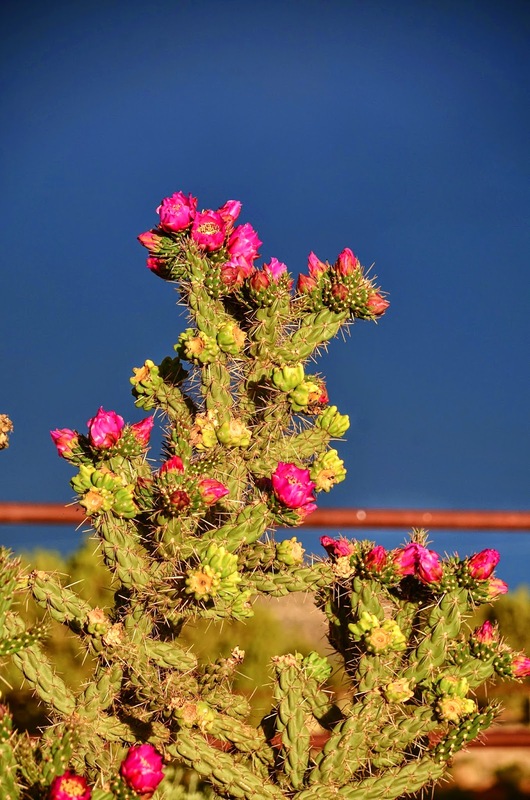 At least the blossoms on your cholla are a pretty color. Here in Nevada they are a greenish yellow, not a lot different from the plant itself. Just as stickery, however. Why are so many gorgeous things evil? Yes, I'm talking about Angelina Jolie as well as cholla. Ha! I won't tell her you said that. Anyway you pronounce it cholla is evil with spines and beautiful with blossoms. We have a neighbor who years ago decided he was going to go all xeriscape and plant cacti, including but not limited to cholla. Poor fella, when the cacti grew so much he could not longer use the front door without injury, he decided to "prune" them. After many failed attempts and many plucking out sessions he had a guy with a back hoe come in and take all of the cactus out. But, when he was replanting a new front yard......the evil spines of the many varieties were still in the ground. "Gone but not forgotten". Beautiful photos of a real stinker plant. As an angler who has had a few encounters with barbed fishhooks while fishing alone, I wonder if a fishhook remover would work to remove cholla spines? If you google it, you'll find a number of different types - some are easier than others to use with your left hand. Oh,just to clarify - I'm talking about instruments that remove fish hooks from the human body, not from the fishies' mouths (though some of those might work too). You'll probably find the ones you want on an online medical supply site or a major fishing source like Cabella's. I couldnt bring myself to eat any of that. Superfood or not. Although it is very pretty, it has a very evil look as well. Blueberry and I have had our share of encounters with these evil cacti many times. I use pliers to pull them out and it seems to work pretty well. I cringe when I hear someone say the name incorrectly. Same thing with Saguaro. thanks for clearing up the pronunciation, i probably should do that with all the german words i use in my blog. otherwise you guys will be totally misled about how we speak. re: blueberry comment - please tell how to say saguaro? i'm not fighting exotic cactus types, obviously, but at the moment i have 7 infected horsefly bites that make me want to cut my limbs off to remove them. i think the horseflies know i'm a foreigner and they love foreign blood (backed up by how my german man gets eaten in america). Beautiful flowers! As far as the fruit being a superfood.........I'd buy a pint of blueberries and eat them instead. We have fruit on our prickly pear cactus, too. Tried to peel/eat one once. First and last time. SO not worth it. 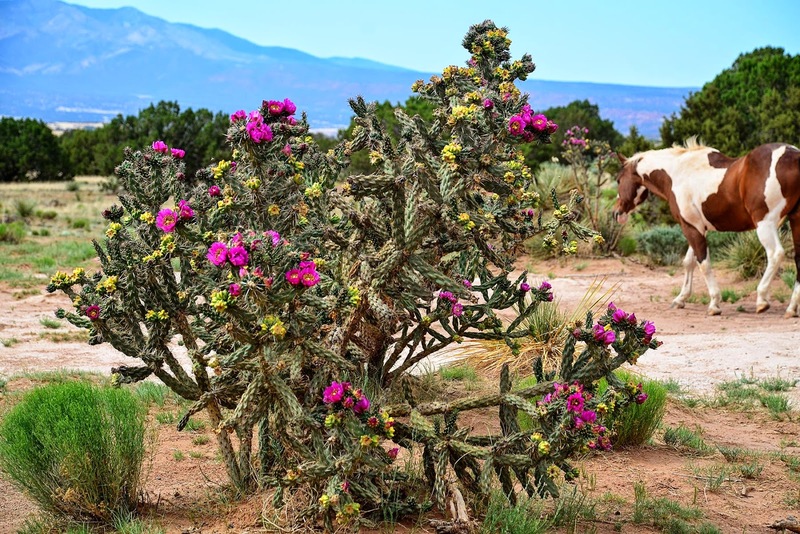 The envious Cholla plant heard the oft-quoted: "Every rose has its thorns" and thereafter vowed to become the thorncushion of the entire plant world. Because roses get all the glory and they just have a few little thorns...so tens of hundreds of thousands of thorns (and some lovely blooms) ought to get the Cholla into the showcase of the flower shop. The "more is better" theory gone horribly awry!!! I know the longears chew on the stuff. Forget if Hank partakes. 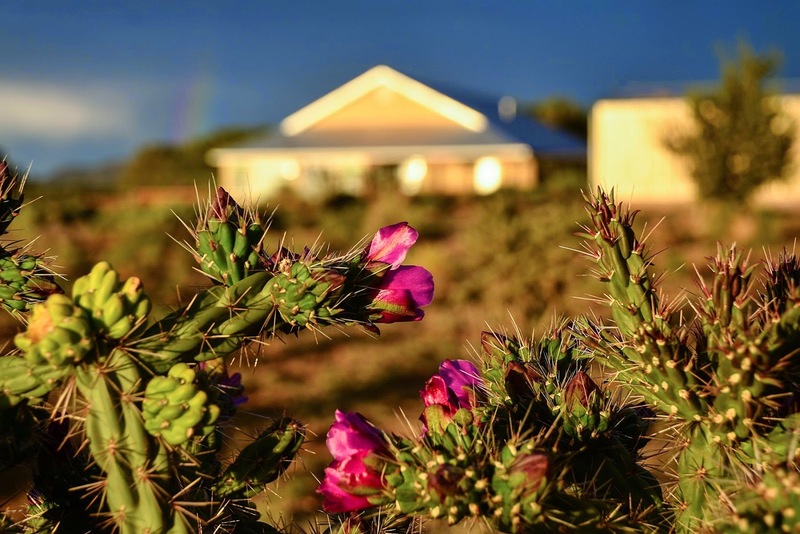 At least now we know cholla is a superfood of the desert. Makes a little more sense. Pictures are wonderful. Be careful.